Habitat: Wetlands and estuaries in coastal areas. Can be found on open freshwater lakes, reservoirs and sewage ponds in dry seasons. 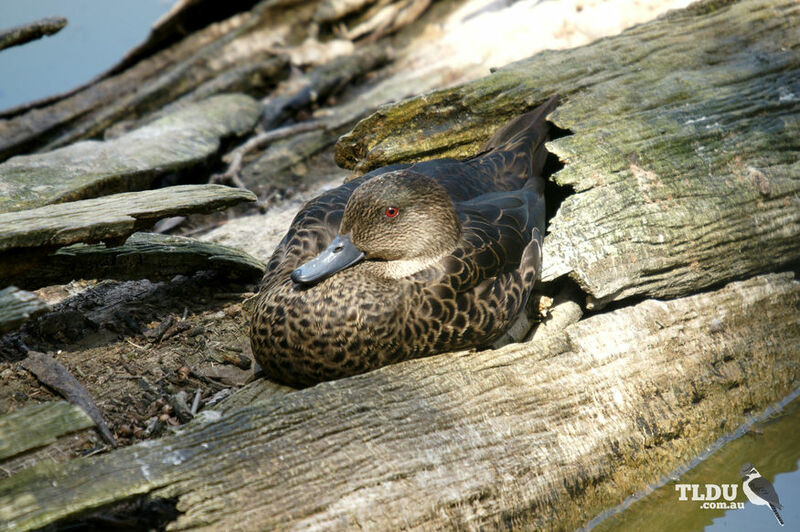 The Chestnut Teal is a small dabbling duck with a high forehead and rounded head. Males are distinctive, having a glossy green head, chestnut brown neck, breast and flanks, dark brown upper body and wings, and a black undertail with contrasting white patch. Females are mottled dark brown and grey, with a pale throat streaked brown and a dark eye stripe. In both sexes the eye is a deep red, the bill is blue-grey and the legs and feet are green-grey. The wings have a dark glossy green to purple speculum (panel) edged white and the underwing is brown, with white wing pits. 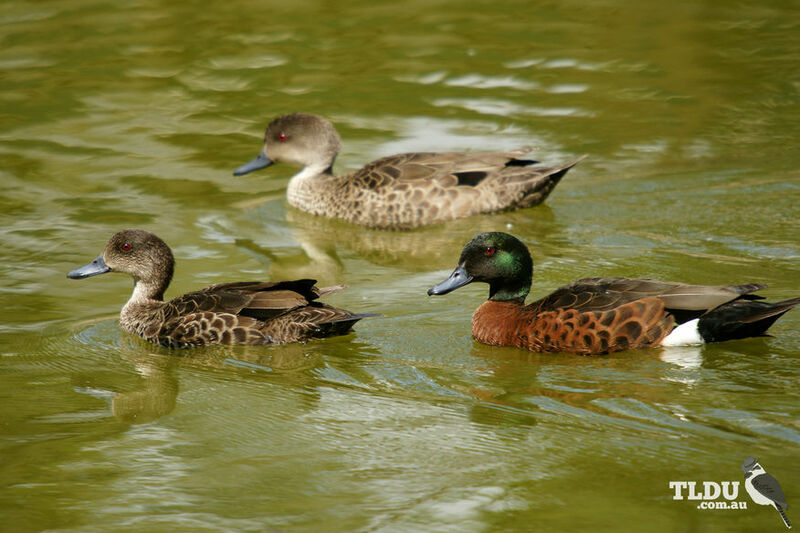 Female and juvenile Chestnut Teals are extremely similar to, but slightly darker than, the Grey Teal. Since the Chestnut and Grey Teals overlap in habitat, behaviour and even calls, it is quite hard to distinguish between the two species' females or young. However, the male Chestnut Teals look very different to Grey Teals, having a distinctive green head and chestnut body plumage. The Chestnut Teal is found in south-western and south-eastern Australia. In the east, it is found from Rockhampton, Queensland to Ceduna, South Australia, being most common in New South Wales, Victoria and Tasmania. It is also a vagrant to New Guinea and Lord Howe Island. Some movements between breeding and non-breeding areas, but many birds do not move far. The Chestnut Teal eats seeds and insects, along with some vegetation, as well as molluscs and crustaceans in more coastal habitats. It mainly feeds at the water's edge during the rising tide, dabbling at food items being washed in. It also dabbles for food while swimming in the water, up-ends to bottom feed or takes food from the surface. Chestnut Teals form monogamous pairs that stay together outside the breeding season. Both parents choose and defend a nest site and the males stay with the female while she incubates the eggs. The nest is usually located over water, in a down-lined tree hollow about 6 m to 10 m high. Sometimes nests are placed on the ground, among clumps of grass near water, and are little more than a scrape, lined with down. Artificial nest boxes of the right size and located in suitable habitat will also be readily used. Males do not assist with incubation but do look after the young when hatched. Sometimes 'dump-laying' occurs, where females leave their eggs in the nest of another female, which accounts for some large clutch sizes (up to 17 eggs in a nest). The young hatch ready to swim and walk within a day, and will move out with their mother onto the water straight away. Both parents defend their brood and will chase off other teal with pecks. If threatened by a predator, parents will feign injury, splash and quack in an attempt to distract it while the young dive or swim off. Predators include: Little Ravens, which eat eggs and young; Blue-tongued Lizards, which eat eggs; Purple Swamphens and Musk Ducks, which take ducklings; Swamp Harriers and Peregrine Falcons, which take adults; and Foxes, which take eggs, young and adults. Chestnut Teals, like most waterbirds, have suffered from wetland modifications such as drainage, increased salinity, grazing, clearing and burning. In coastal areas, their preferred estuary and inlet habitats are threatened by increased development, however their ready adoption of nest boxes is promising. In areas where hunting is permitted, they are widely hunted, but can find refuge in sanctuaries, and they represent a low proportion of the total shooting 'harvest' for south-eastern Australia. The introduced Fox is a major predator, eating eggs, young and adults.